From Salman Rushdie, one of the great writers of our time, comes a spellbinding work of fiction that blends history, mythology, and a timeless love story. A lush, richly layered novel in which our world has been plunged into an age of unreason, Two Years Eight Months & Twenty-Eight Nights is a breathtaking achievement and an enduring testament to the power of storytelling. 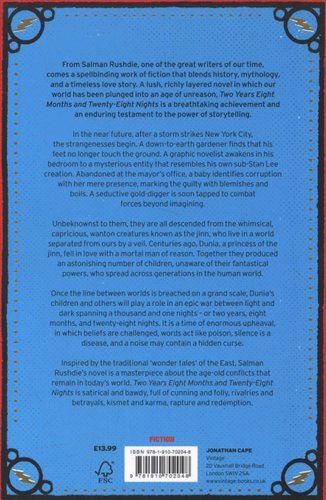 In the near future, after a storm strikes New York City, the strangenesses begin. A down-to-earth gardener finds that his feet no longer touch the ground. A graphic novelist awakens in his bedroom to a mysterious entity that resembles his own sub-Stan Lee creation. Abandoned at the mayor's office, a baby identifies corruption with her mere presence, marking the guilty with blemishes and boils. A seductive gold digger is soon tapped to combat forces beyond imagining. Unbeknownst to them, they are all descended from the whimsical, capricious, wanton creatures known as the jinn, who live in a world separated from ours by a veil. Centuries ago, Dunia, a princess of the jinn, fell in love with a mortal man of reason. Together they produced an astonishing number of children, unaware of their fantastical powers, who spread across generations in the human world. 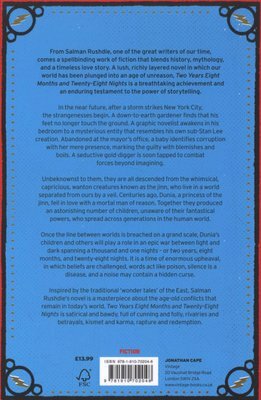 Once the line between worlds is breached on a grand scale, Dunia's children and others will play a role in an epic war between light and dark spanning a thousand and one nights - or two years, eight months, and twenty-eight nights. It is a time of enormous upheaval, in which beliefs are challenged, words act like poison, silence is a disease, and a noise may contain a hidden curse. Inspired by the traditional 'wonder tales' of the East, Salman Rushdie's novel is a masterpiece about the age-old conflicts that remain in today's world. 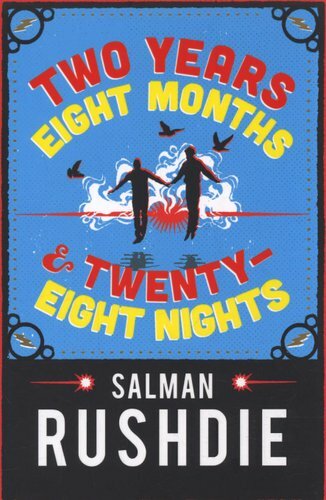 Two Years Eight Months & Twenty-Eight Nights is satirical and bawdy, full of cunning and folly, rivalries and betrayals, kismet and karma, rapture and redemption.